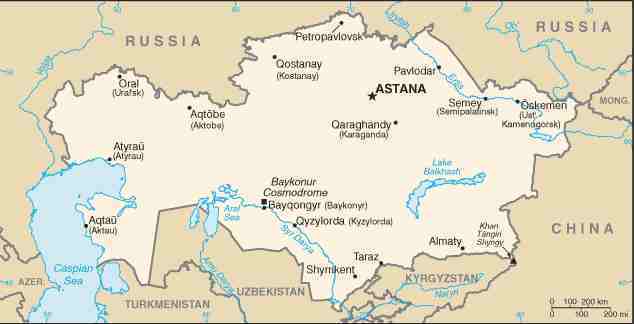 Hui Chin and I took a bus from Bishkek in Kyrgizstan to Almaty (Good old Alma Ata) in Kazakhstan and we lived through some very unusual and unforgettable experiences. It really started in Beijing trying to get our Visas. We stood in the queue outside the Consular Office for about five hours and we were the next one to go in, when we were told that's it for the day, we'll have to come back tomorrow. I had a very sore ankle, that was dislocated about 12 month before and had a habit of recurring pain, real pain. This was one of those recurring pain times, although we both tried to sit down at the curb-side, to me it appeared more uncomfortable at times, than standing around in the queue, were at least we could diversify by talking to some one. We decided to get some kind of stools to take along next morning. We were very fortunate, on our way to the market we found some very small, very fancy little stools, very cheap too, just around the corner from our hotel. We went, armed with our stools before five a.m. to make sure we'll be the first ones in. There were about 8 people there already, some waiting since 3 a.m. Anyway, we did get our visas, by 10.30 a.m.
We visited a few other places in China after Beijing and Kyrgizstan was on our itinerary before we went to Almaty, so we decided to get a bus to Almaty. We chosen an official bus, which was in the bus station and took a while to fill up and they wouldn't leave until they are full, never mind about a timetable. The official buses are cheaper, but take longer to fill, because the unofficial, minibuses grab all the intending bus passengers at the front gate. There was a young Kazakh lady travelling on the bus with us, she was beautiful, very helpful, well educated and she spoke very good English. The bus from Bishkek to Almaty, - about 4 hours bus ride - have to cross the border, about halfway into the journey. We had to walk from the Kyrgiz Border Post to the Kazakh Border Post and our trouble started just about immediately. I taken a couple photos of the border and the guards, which is a very big no, no around here. So I had a bit of a run in with one of the officers, and the nice young lady was standing aside just in case she was needed. We had to pile into, - about 200 of us - a small room, that normally would have trouble holding 50 of us. There was heaving and showing, everybody tried to get to the counter in a very big hurry, and many even chatted up total strangers as "Papa" just to get near the counters. We had suitcases, backpacks and shoulderbags etc. and the pushing and shoving just got worst all the time. We both were very worried about 'pickpockets' in this bedlam. The young lady was right beside us, although being a local she could have gone straight through. She was even yelling at the crowd to give us a chance, and don't show us, tourist a bad impression. Things eased off momentarily, but only momentarily. We didn't need the young lady's help here neither, but it sure felt comforting that she made herself available if the need arise, she knew we didn't speak neither of the local lingo or Russian. After about a hour of that over packed 'live sardines' in a small tin, we got through and soon were on our way. Well, the 'soon' was after our driver and our young lady went back to the guard post to look for a missing passenger. That took about 20 - 30 minutes, they didn't find him, so we left and arrived in Almaty about 2 hours later. With one of our suit cases got damaged in the back of the bus we had some trouble dragging it along on a very hot afternoon on the streets of Almaty to find ourselves a hotel. We normally don't use taxis, because of the cost and this particular time we didn't even have any of the local money. I suppose we could have changed some money at the bus station, if we thought about it at the time, or if we could find a money changer, our immediate worry was to find a hotel near or in the city centre as soon as possible. Of course we didn't know where was the city centre and no one could understand us either. After about 2 km rambling along a long bridge, we seen a hotel and tried to book in, without worrying about the city centre right then. I had all sort of trouble getting through to the receptionist, luckily one of the staff - more willing to listen and try to understand me and probably more intelligent too, figured things out, written down the room rate, lent her glasses to me so I can see those figures etc. than she also explained to me by all sorts of sign language, that we need the room rate now to book in. After some more 'argy-bargy', she also shown me a money changer across the road. (How convenient? After all those goings on). Meanwhile Hui Chin was waiting and wondering what was going on, down at street level minding our luggage. Hotelled, scrubbed and slept, spent the next couple days exploring Almaty from head to toe.